Eagle Ridge and Prince Of Arran are our Friday runners as they head to Geelong. Prince Of Arran is the first to go in race six, the Class 1 Handicap over 1900m where he will be ridden by Brian Higgins and jump from barrier three. The son of Nadeem was only beaten 1-1/4 lengths over 1717m at Sale last start and Racing Manager Anthony Feroce says has pleased the stable since. “He has trained on very well since his last start second and we feel he has improved since then,” Feroce said. “He is drawn to get the run of the race from barrier three and the only question mark we have is it being his first start on the synthetic track. Eagle Ridge (pictured) runs in race eight, the Benchmark 84 Handicap over 1300m with Stephen Brown reducing his weight to 59kg. The three-year-old has been scratched recently after drawing wide but has had better luck here. 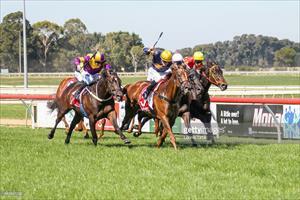 “He has finally drawn a nice barrier after getting some wide draws but barrier four is ideal,” Feroce said. “This is his first start since having the little issue at Flemington in May but his work on Tuesday morning was first rate and he looks terrific.